According to this answer Star Trek was originally going to be titled "Wagon Train to the Stars", because Gene Roddenberry had a lot of experience with writing old westerns, and his idea was to create a space western, replacing rifles with lasers and wagons with starships. At some point (thankfully), that name was scrapped, and was changed to Star Trek. But in that answer one question goes unanswered: why the name change? Who, what, or why did this iconic show get a name change? Who do we have to thank for this much less cumbersome name? As Paul D. Waite pointed out in the comments, this answer deals with your question quite handily. Wagon Train, a popular western, would have had quite an easy trademark case against the show if it had so blatantly used a name derived from it. They could have easily argued that any success of the space show derived in part from the explicit tie to their popular Western. Similarly, if the space show fared poorly they could argue the same link damaged their show. Therefore, it was completely impractical to call the show Wagon Train to the Stars. Even if it had been practical from a legal standpoint, the name is too long. Most shows have snappy, 1-3 word titles. Those which don't have easy titles don't find themselves being discussed as often - people will just talk about a show called Glee more than they would Singing Teenagers With Social Issues. The word Trek mean to travel or explore. It's not in common usage, even at that time, so it tends to stand out in people's minds. The word Star, of course, indicates that the show deals with space. At the time, when the Space Race was on, space was HUGE (which is why a 'Western, in space' was such an appealing concept). Thus, Star Trek was chosen as a superior name. I do not know who originally thought up the name, but once they did, I expect it stuck quite quickly. As Paul D. Waite pointed out, the term "Wagon Train to the Stars" was clearly nothing but a working title that referenced the original inspiration (the Western "Wagon Train")... but not a title ever mean to stay. 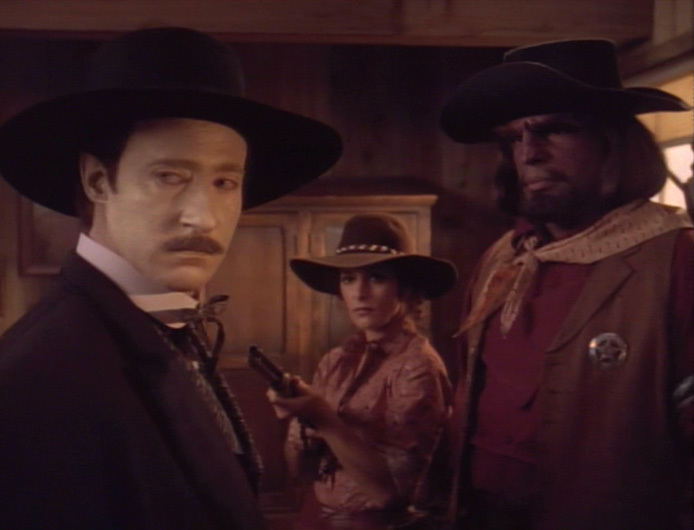 Adding to the previous answers, it's worth noting that Star Trek ended up being very different from a Western. While Star Wars and especially Firefly have a strong Western vibe to them, I can't really say that about Star Trek. Star Trek is about the exploration of new worlds the same way Westerns were about the exploration of the Western states of North America, but that's about the only real similarity they have. Also, note that the term "Wagon train" is a reference to 19th century technology, which doesn't really fit a series taking place in the 23rd century, focusing on space ships. Star Trek was ALWAYS the title of the show! Wagon train to the stars was how Gene Roddenberry pitched the show to the network, as noted in previous posts. By the way, you can thank Lucille Ball for Star Trek, as she owned Desilu Studios and pressed for it, as well as NBC for authorizing a second pilot after deeming "The Cage" as being "too cerebral" for American audiences. Why did Shran call Archer “Pink Skin”? ST: Voyager - Why did Alice call the particle fountain “home”? In Bread and Circuses did they forget to rescue the remaining federation officers from the planet? Where do they get the costumes from in TOS? Why is the space outside the Enterprise blue, not black?